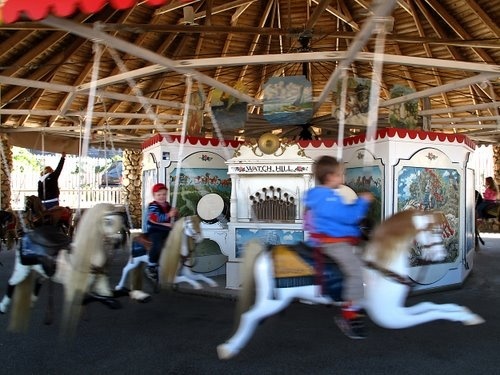 Kids Will Love the Ancient Flying Horse Carousel in Watch Hill, R.I. The Flying Horse Carousel certainly stands as a ‘mane attraction” in the Westerly, R.I., coastal neighborhood of Watch Hill. Possibly the oldest carousel in the United States — dating back to 1884 — this creaky old wooden carousel features 22 jumping horses suspended from chains, leather saddles and an operational ring arm. The center frame allows the horses to fly or “swing out” when in motion! At first glance, the Flying Horse Carousel looks less substantial than some of its modern day predecessors, but ultimately its simple, uncomplicated look and operation doesn’t get in the way of kids having a ball and getting back in line after the first ride. With its location right next to beautiful Watch Hill Beach, ice cream places and beach side shops and restaurants, the scene is almost like one you’d see in one of those nostalgic 1950s movies. depicting a carefree summer. Unlike other carousels where you just ride around, the Flying Horse Carousel has a simple, non-tech game where kids collect silver rings each time around. Someone, however, will collect a bronze ring, thus entitling that person to a free ride! Oh, yes, and the admission fee is nominal, making this a certifiable cheap travel attraction! While no one over 12 can ride the carousel, it seems like everyone near this designated Rhode Island National Historic Landmark has big smiles on their faces. That’s what summer is all about, isn’t it? For more information on thee Flying Horses Carousel, call 401-348-6007.